His Excel-lence (geddit?) Paul Crowther has been at it again, using his favourite packages sophisticated graph-plotting facilities to produce the interesting figures that go with another guest post…. Last week’s Times Higher Ed included a news item headlined ‘binary creep’, in which HEFCE were considering restricting support for PhD research students to universities of the highest research quality. Concerns were expressed in the article about a two stream future for universities – research intensives in the fast lane and ‘the rest’ in the slow lane. This reminded me of a recent Times Higher Ed interview with the former Commons’ Science and Technology Committee chairman, Lord (Phil) Willis. Lord Willis argued that the UK could probably sustain “no more than 30” universities with the capacity to attract the best global researchers and carry out world-class research, a view no doubt shared by ministers and civil servants within BIS. I should qualify the following line of thought by emphasising that this is not Government policy, although both stories reflect moves by funding agencies to further concentrate increasingly scarce resources on the highest ranked research universities. For example, in England HEFCE is expected to withdraw all quality-related (QR) support from 2* RAE research from 2012 onwards. Mindful of the fact that in such a vision for the future, there would be a comparatively few, research intensive universities (`winners’) where would that leave the remainder (‘losers’), especially for physics? Research quality can be quantified in all manner of ways, but for simplicity I have adopted the Quality Index (QI) from Research Fortnight which provides a single mark out of 100 based on RAE quality profiles (4*:3*:2*:1* weighted 8:4:2:1). 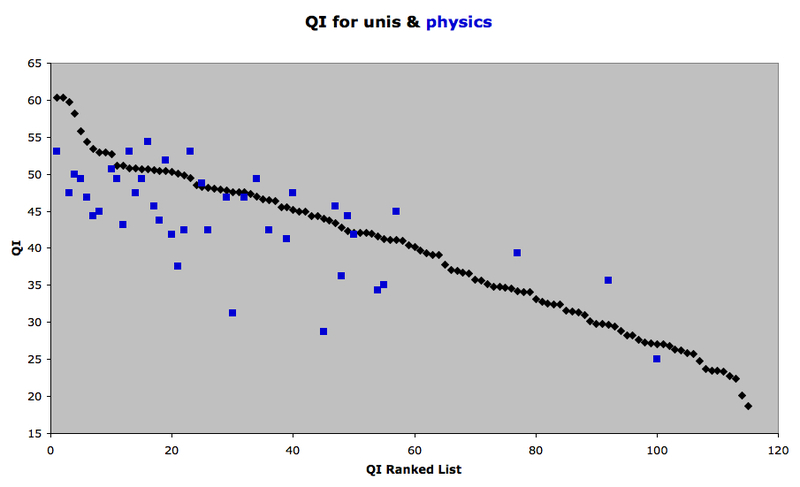 The chart below shows the QI-ranked list of more-or-less all 120 UK universities who were rated in RAE 2008. It will come as no surprise to anyone that Oxbridge, LSE and Imperial top the rankings, closely followed by UCL and a few other high flyers, but beyond the top 10 perhaps more surprising there are no natural breaks in quality from Durham and QMUL in joint 11th place, to Bolton at 107th. 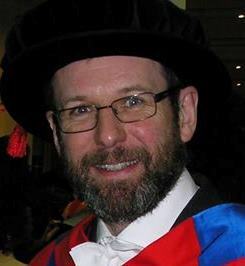 Thinking out loud about Willis’ assertion that the UK should not be spreading the jam more thinly than, say, the leading 30 universities, there would obviously be individual physics departments currently outside the top 30 which are ranked significantly higher than those within the top 30. To illustrate this, the chart also includes (in blue) physics QI scores for all teaching institutions that were assessed under the UOA 19 in RAE 2008. To blindly follow Lord Willis’ suggestion, 16 out of 42 institutions involved with physics research – comprising 37 per cent of all academic staff – would be clear losers. These would include one physics department raked within the top 10 (scoring 49) because its host institution is ranked 34th overall, while winners would include a department scoring 31, i.e. ranked 40th (out of 42) for physics, as a result of its university squeezing into the top 30. 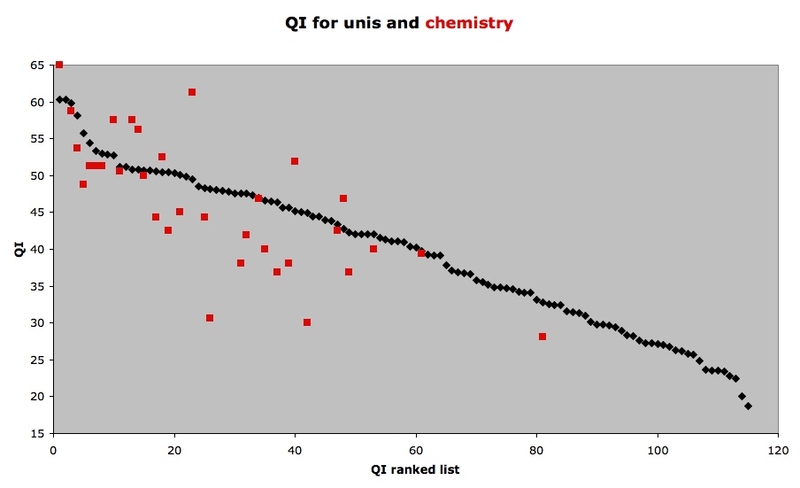 Chemistry – within the same RAE sub-panel as physics – reveals a broadly similar distribution, although there is perhaps a greater concentration of the highest research quality in the overall top 20, as the chart below illustrates. Alternatively, if there is to be further concentration, one could argue that research funding should focus on, say, the top 20 physics departments regardless of the performance of their host institution. Indeed, already 80 percent of STFC spending goes to only 16 universities. 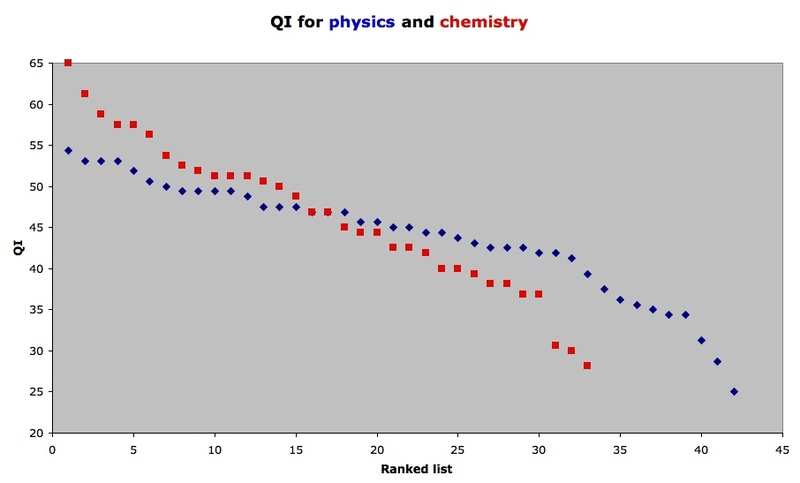 Still, as RAE grades indicate, a strength of UK physics is the breadth of high quality research, with no natural break points until beyond 30th place in the rankings, as the final chart shows. Of course, RAE scores aren’t the sole criterion being discussed, with “critical mass” the other main driver. Due in large part to the big four, 70 per cent of physics academic staff submitted for RAE 2008 are in departments that are currently ranked in the top 20. Chemistry has a similar story to tell in the chart, albeit displaying a somewhat steeper QI gradient. What might be the long-term consequences of a divergence between a small number of “research-facing” universities and the rest? It is apparent that if the number of physics departments involved in research were reduced by a third, some high quality research groups would be lost, regardless of precisely where the cleaver ultimately fell. Let’s too not forget that astrophysics represents the largest sub-field of physics from the last IOP survey, as measured in numbers of academics. If policy makers don’t see anything fundamentally wrong with A-level physics being taught by teachers qualified, say, in biology, then they might too wonder whether physics degrees could be taught by academics lacking a physics research background? This might work for first year undergraduate courses, but thereafter isn’t more specialist knowledge needed that a research background most readily provides? How would the third of physics academics outside the top 30 universities react to the prospects of a teaching-only future? Many surely would consider jumping ship either to one of the chosen few or overseas, further decreasing the pool of those with research experience in the remaining physics departments. This is further complicated by the expected political desire that physics departments should be appropriately distributed geographically across England, Scotland, Wales and Northern Ireland. As a final thought experiment, the fate of physics departments facing the prospect of a teaching-only future might also be binary in nature, either (a) whither and die, decreasing the range of institutions offering degrees in physics (or physical sciences, natural sciences etc. ); perversely at a time when the Government are anxious to maintain the number of students studying Science, Technology, Engineering and Mathematics (STEM) subjects, or (b) thriving – free from the distractions of chasing dwinding research grants – by adapting to offer shorter duration physics degrees, described as “cheap and cheerful” by Dr David Starkey during the discussion on student fees on last Thursday’s Newsnight. To reiterate, it is not explicit Government policy to actively reduce the number of physics departments that receive research allocations, but this seems to be the general “direction of travel” in policy-makers speak, so I fear a rocky path ahead..